When opportunity came knocking, we quickly answered. We were presented to add Momentum to our herd at the ADGA National Show in July, and we pounced quickly. 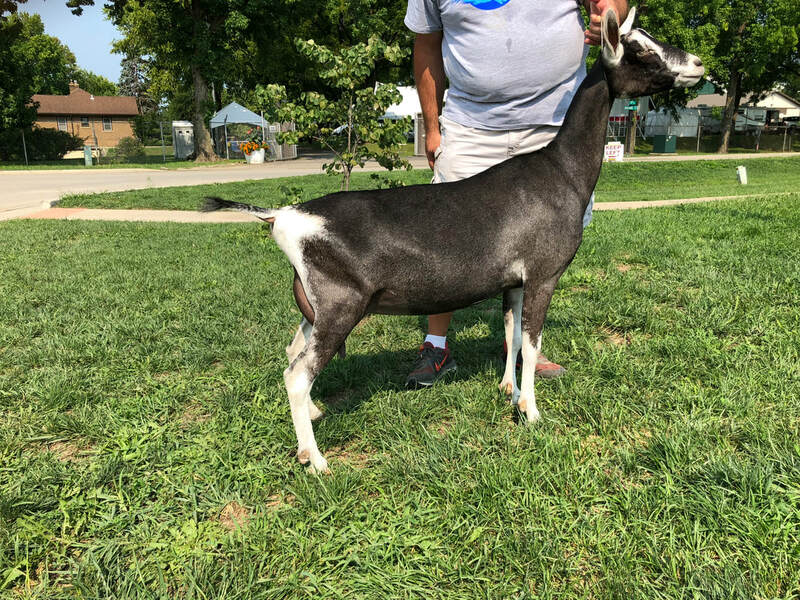 Two days after we agreed to purchase "Mo", his dam went on to be the Reserve National Champion at the 2016 ADGA National Show. We love the first kids out of Mo as they excel in length and refinement. His first milking daughter is long and tall with a long fore udder. Currently, we will know more in 2019 with two more fresh daughters. His Junior Get of Sire was 2nd at the ADGA National Show. We kept this buck kid last year when we decided to sell Rainmaker. We felt that he would complement Echo's general appearance while maintaining strength of feet and angulation of rear legs. In the few breedings we made, he is not disappointing us. He sired the first and second place junior kids at the ADGA National Show. We will be using him rather fully this year because we believe he will add size, width, and strength of bone. Kold War Hero was brought in as he is linebred on some of our top doe lines- including Scandal, Whimsay, Zamboni, and many others. We believe he will compliment some of the other stuff we have in our herd.